NEW YORK Jim Power is a bit of a local celebrity in New York City's East Village. A Vietnam vet, he'll stop to talk to anyone who is willing to listen: The story of when he was evicted as a squatter; the story when he ran into former President Carter on the street; the tricks his dog Jessie Jane can do. If you don't recognize his face, you might recognize his mosaics. 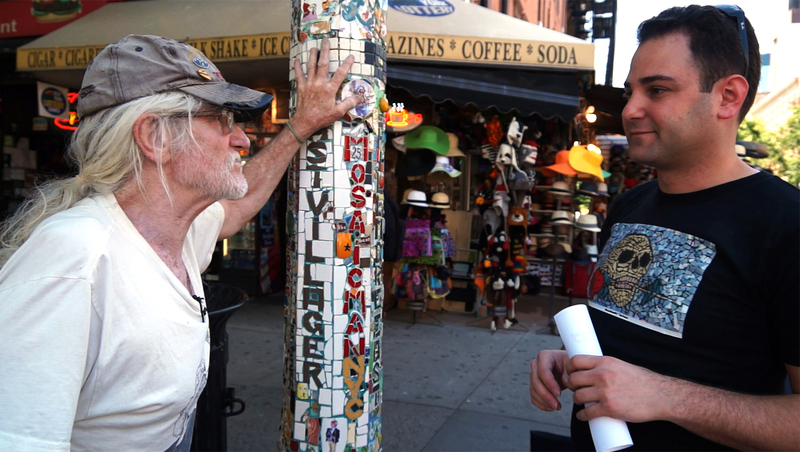 He calls his series of lampposts the "Mosaic Trail," and each one is unique. Many of the tiles are either found or bought. Some of them represent a moment in history, while others are tributes to people or agencies, like the New York Fire Department. One pole outside Cooper Union, for example, bears the names of Susan B. Anthony and former President Clinton, who both spoke at the famed Great Hall. He claims President Obama once did a double-take while passing the pole when he spoke at the same spot three years ago (that's another story he likes to tell). Power said he moved to New York City from Ireland in 1959. After serving in Vietnam, he briefly worked in construction and lived on the streets, making his first mosaic pole in 1987 or 1988. "I'm a post-traumatic-stress survivor, if there is such a thing," he said. "And I do believe this has a therapeutic value." The Village Voice dubbed him the "Mosaic Man" in 1988, and the city eventually gave him permission to continue his work on public property. A proclamation signed by Mayor Michael Bloomberg in 2004 thanks Power for "beautifying the city with distinctful, artful mosaics." The police officers in the area are familiar with Power and his work and generally leave his mosaics alone. Now 65 years old and living in assisted housing, Power still makes mosaics, his canine companion by his side. But many of the poles are half-finished, or are falling apart. Many have been removed - about 20 are left from the total 60 or 70 he's built over the years. As an artist, Power has a lot going for him. He has a brand, an audience and the city's blessing. But he can't read very well, and he can't write. He's disabled and walks with a limp. It was stopping him short from getting the broader support he needed to continue his work. That's where Matt Rosen comes in. He connected with Power about two years ago. "Jim's work has been really cool, I've seen it forever," Rosen said. "I've always enjoyed and appreciated it, and despite being one of the newcomers, if you will, to the neighborhood - I haven't been around for 40 years - I still have an appreciation for what came before. So when Jim said, 'Hey, help me out,' I said, 'Yeah, I could probably do that for you.'" Rosen had previously proven his social media skills to the community by helping another iconic institution, Ray's Candy Store. Matt played a major role in transforming the financially troubled ice cream shop into a relatively well-known East Village spot, volunteering his online marketing skills to put Ray's on the map. What started as a favor to Power turned into a full-blown PR campaign, which takes hours of Rosen's time, on top of his full-time job helping run an e-commerce platform for wine retailers called WineFetch. Rosen runs Jim's Facebook page, his Twitter account and his main Tumblr site, which has amassed more than 67,000 followers and got him on the site's "verified artists" list. Rosen was also key in creating Power's Etsy shop, which he says sold 20 mosaic belts within two days of opening. "Jim made two grand in 48 hours - that's pretty good for a homeless guy," Rosen said. An online fundraiser campaign on Indiegogo also helped raise more than $5,000, some of which went toward the scooter that helps Power get around. But Power had held even more ambitious goals. He wanted to raise $80,000 and hire full-time labor to finish decorating the 80 poles the city allows him to touch. "I don't see it happening," Power said. "I'm not pulling rabbits out of the hat any longer. I'm not even going to try." Still, Power's influence over the years is unmistakable. National Geographic recently added the Mosaic Trail as a must-see to its Walking New York travel guide. "Up until recently, if you looked at a guide book about downtown New York, they talked about Katz's Deli and they talked about the Tenement Museum, which are institutions unto themselves, but this neighborhood is awesome," Rosen said. "It's got a lot more to offer than Katz's Deli - if it brings them to the bars, it brings them to the restaurants, everybody makes out." Tourists love the colorful art, but no one is as enthusiastic about his work as the people who know it best: New Yorkers. Courtney, an New York University alum, was giving visitors a tour of the Village when she saw Power telling CBSNews.com about a wall mosaic he created in the '80s. It was as if she came across a childhood movie star. "It must be 30 years I've been watching these going up," she said, giving Power a high-five. "Thank you so much Jim." Rosen is still weighing strategies about what to do next in his campaign for Power, but he said he plans to keep helping out until the artist calls it quits. And Power will continue doing what he's done for years: Making mosaics.